Corn tortillas wrapped around hot dogs with melted cheese inside. 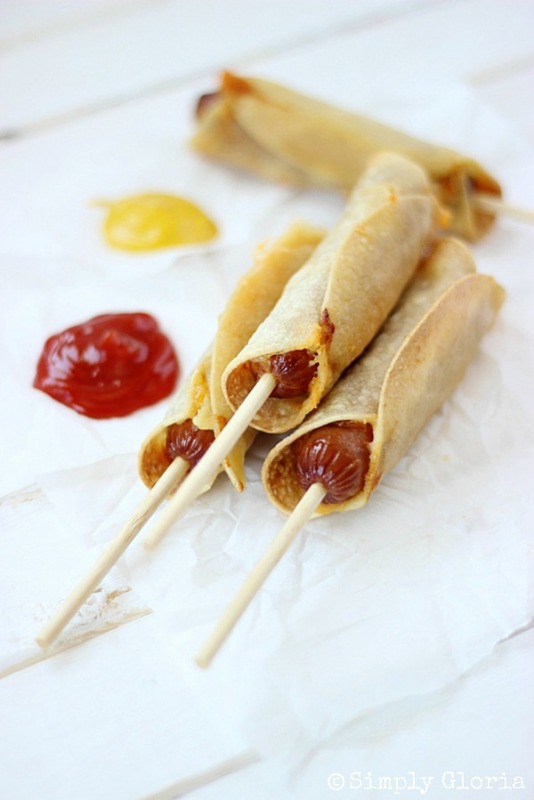 These Baked Corn Tortillas Cheese Dogs are crispy with every bite and fun to eat! Hot dogs are a favorite in our home. Typically hot dogs go great inside a bun. But, how about a wrapped corn tortilla? That’s exactly what I’ve done, my friends. These Baked Corn Tortillas Cheese Dogs are a little out of the norm. But, that’s how it is around here. You may say they are a cross between a burrito and a corn dog, maybe? Little East comes home every day for lunch. So, I try to be a little creative and mix things up a bit. Do you know how picky a 7 year old can be?! If and when he eats a hot dog, he prefers a stick in it. I guess that makes it so much more fun, right? 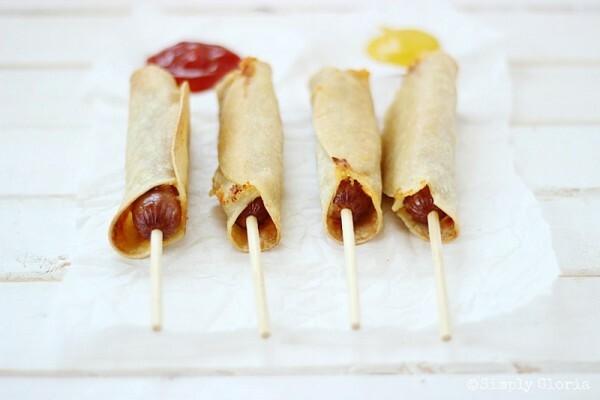 Putting these Baked Corn Tortillas Cheese Dogs together are very simple. Grab your favorite kind of hot dogs, some cheese, and corn tortillas. And, don’t forget about the fun part… short wood skewers. As Easton says, easy peasy! 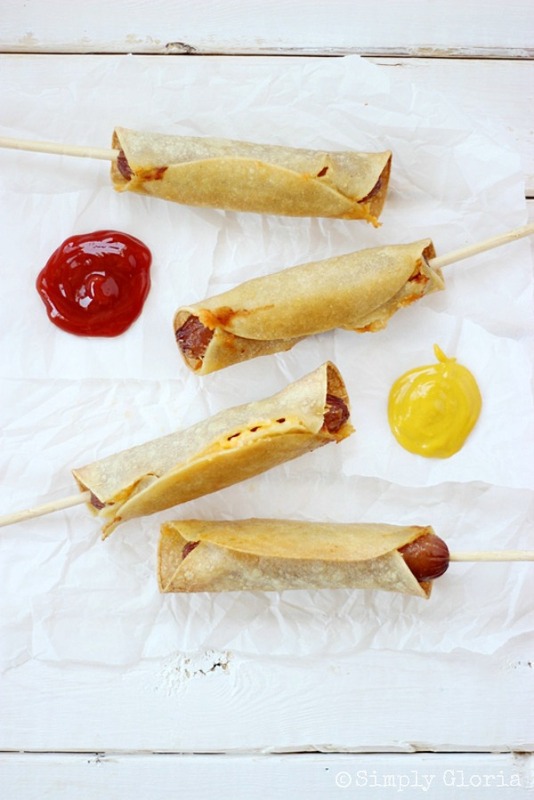 Corn tortillas wrapped around hot dogs with melted cheese inside. 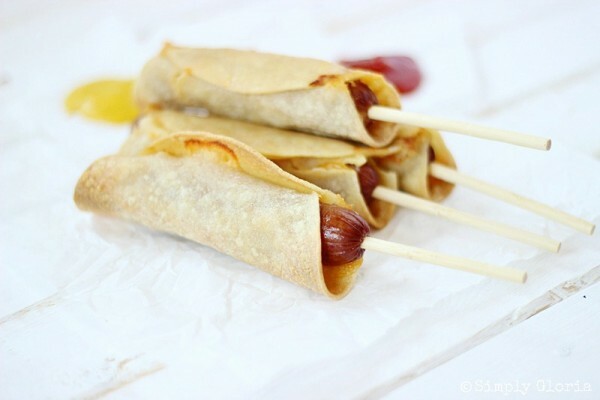 These crispy Baked Corn Tortillas Cheese Dogs are crispy with every bite and fun to eat! Heat corn tortillas in the microwave for 30 seconds between paper towels. (This will make them roll and bend without breaking.) Brush olive oil on the bottom side of each corn tortilla. Put a slice of cheese and hot dog on the top each one. Roll it together and tuck face down onto a nonstick covered baking sheet, so they will stay closed. Bake for 20-25 minutes in a 375 degrees oven. You may choose to put skewers in one end of the hot dog before or after baking time. I do both ways. What is your favorite way to enjoy your hot dog? « Spring Into Summer Camera & Lens Giveaway! These are so cute! My kids would get such a kick out of them. What a great idea for a party for kiddos. I don’t like hot dogs. But these are the cutest, funnest, most delicious looking hot dogs I’ve ever seen. That is saying something. I think it is the burrito … 🙂 My siblings will love this! Pinning! Mary Frances, I’m the same… not really a fan of hot dogs. I’m actually very picky if I do have one. Hope you’re having a fabulous day! They are really fun! Thanks so much, Sam! I love this version of a corn dog, it’s so much more healthier and they are so cute! Marti, you just made my day! These are such a great idea Gloria! I am going to try them for my kiddos! I think they would really enjoy them! Ok, these are so cool and so easy to make. My older son Blake (12) has such a liking for corn dogs and I hate that, so these are such a better alternative. I would gobble a couple down myself too! And by the way, Easton is on our name list for our new little guy due in 4 weeks. Matt, I’m so big on the corn dogs, either. They are always under cooked when I buy them from somewhere… all doughy in the middle. I love the whole look and idea of these. I love that they are on a stick too. I’m planning a 5 yr old birthday party for next month and these would be great! Shannon, that would be a great idea with the 5 year olds! Besides, so easy to whip up along with everything else you have to do to get ready. Have so much fun! Gloria, what a fun idea! These will be great for the summer and I know everyone loves food on sticks. 🙂 Pinning! Thanks for sharing and have a happy Wednesday! Cindy, you’re right… food on a stick, in the summer time is so much fun! I’ve even grilled these before– very delish! My wife is going to go ga-ga over these! She LOVES hot dogs and is always excited when she can eat them in new exciting ways! These look great!!! Thanks, Chris! Hot dogs are fun to be creative with! Ryder loves food on a stick too! He’s love this, I kid you not, he eats at least one corn dog a day! I always love your pictures too, Gloria! Paula, you seriously just made my day! It’s funny how the boys go through their fun food stages. Easton was just asking me today, why do I have to keep making homemade chicken nuggets for his lunch when I should be just grabbing the Mickey Mouse nuggets bag at Costco! Because… my boys would devour the whole entire bag in one sitting. No lie. The whole baking sheet will be filled with those! Very cute idea. Pinned to my Lunch Ideas board! What a fun twist on regular corn dogs! These look delicious, too! Pinned! I’m kind of a sucker for corndogs, or pigs in a blanket or just a good old fashioned hot dog, so I’m totally loving these! So cute! Nicole, so am I! We grew up on hot dogs because they were so cheap. But, now there is such a huge variety on healthy and/or beefy ones! This is such a cute idea! It’s just like a corn dog, only easier. And with cheese! I bet my boys would love it. It’s a sure winner with boys… I only know because my house is full of them! Hope you’re having an enjoyable day, Allie! Oh my gosh! These hot dog sticks are too cute, Gloria! Love how easy and mess-free they look. My family would be all over these. 🙂 pinned! Sarah, you are so sweet! Your family will love when you pop these out for dinner or lunches during the summer! It’s pretty funny how much I love hot dogs. My husband mentioned last week that we’ve been eating hot dogs quite a few times lately, so I decided to take a break this week. With Cinco de Mayo right around the corner, I’m pretty sure we’ll be having these on Monday to celebrate. Such a fabulous idea. Hope you’re doing well, dear! Thank you, Gina! Hope you’re having a happy Thursday! My mother used to make these for me and my siblings all the time! Instead of the stick, she would put a toothpick in the side to keep it from unrolling. We loved it when she made these! The melted cheese makes them oh so good! It’s been (um) decades since I’ve eaten one. I can’t wait to make these for my girls! Thank you for the memory! 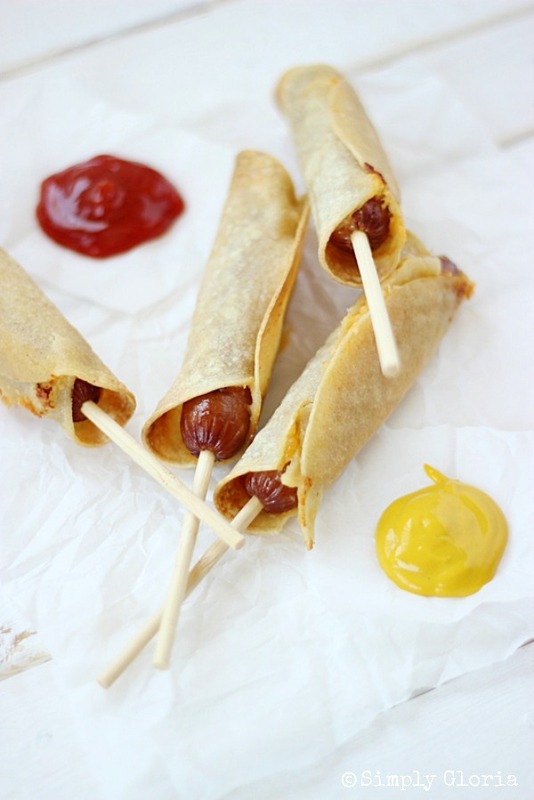 Gloria this is such a fun twist on corn dogs that’s perfect for Cinco de Mayo and for kids, I love this! My youngest thinks these are more fun than the old corn dog. Yours would, too! Hope you’re having a wonderful Saturday, Kelly! So, this is pretty much the coolest idea ever, Gloria! 🙂 I love this- how fun! Pinned! Thank you, Carrie! We can eat these and drink your margaritas together! I LOVE your “fried not fried” food ideas! Normally I don’t care for corn tortillas, but I can imagine these taste pretty good! 😀 Def want to give them a try! Oh and I bet my boy would enjoy these, he loves all things hot dogs! My little guys are going to love these! They rip half of the darn bun off anyways, so I know they will love this better anyways! You’re so clever! Tahny, my boys have always torn the corn dog to pieces, too! It drives me crazy and makes me wonder whey I even bought the darn thing in the first place. Hope you’re having a wonderful evening! Ahhh! this looks like so much fun to eat! Would be perfect for a game night in my home! Connie, I love food like this on game nights… thank you! Tina, you are too funny! (And, we are so alike!) Hubbys are weird like that! Thank you for the pin action, Rachel! Oh these look perfect for the summer picnics I have been dreaming about. Mallory, that sounds so much fun right now! Summer picnics are the best! Wow, I have never seen anything like that before! Such a great idea with the tortillas 🙂 I think it would be a perfect starter at a barbecue party. Thanks for sharing the recipe! Maja, what a great idea as a starter at a bbq party! Thank you! What a creative idea! So glad I stopped by. I always need another idea for my little ones for lunch. We get tired of ham sandwiches! Elizabeth recently posted…Tamale Pie: Cinco de Mayo Celebration! Elizabeth, I totally hear you… I get so tired of making the same thing everyday for my youngest, too. Your kiddos would think these are fun! Tried this tonight – these are my absolute favorite way to eat hot dogs now. The tortilla gives a delightful crunch you don’t get with a corn dog, but you still get the great corn flavor. And, I don’t feel like I’m serving total garbage to my family (we all know hot dogs aren’t great for you). I made a spicy adobo-mustard dipping sauce that we all enjoyed and I can’t wait to try it again! Thank you thank you!! These look great! My kids are not huge fans of sandwiches, but they prefer to take their lunches to school. They will love these! I was wondering how a good beef hot dog would taste in corn tortilla as I’m greatly limiting my intake of flour/gluten foods. Thank you for the idea and for giving my sometimes dull skull a much needed wake up.